Ryan so generously offered to be my second ABR test subject, so we went to the lab mid-afternoon. What a guy! He has four electrodes attached to him: two on his forehead and one behind each ear. His job was to relax/sleep in a small, dark, soundproof booth while I monitored his brain wave responses to click sounds. He did a superb job and fell asleep twice. After testing, I spent the rest of the afternoon studying in the student center with Starbucks! I feel like I crossed a decent amount off the school “To-Do” list, and I made time for fun, too. -Chatting with Ryan, Andrea, & Alex after our dinner and movie date. We sat at a table in the student center (with free coffee samples from Starbucks) and talked. -Dinner deal with Ryan on Saturday: We went to the grocery store with the following rules: Each person must pick out 2 veggies, 1 fruit, and 1 surprise item. We split up. My items: sweet potatoes, spaghetti squash, mango, ice cream. Ryan’s items: sweet potatoes, lettuce, mango, ice cream. WHOA. I traded in my mango for a cantaloupe, and we picked out bread and shrimp to round out the smorgasbord (definitely googled how to spell that) meal. It was delicious! 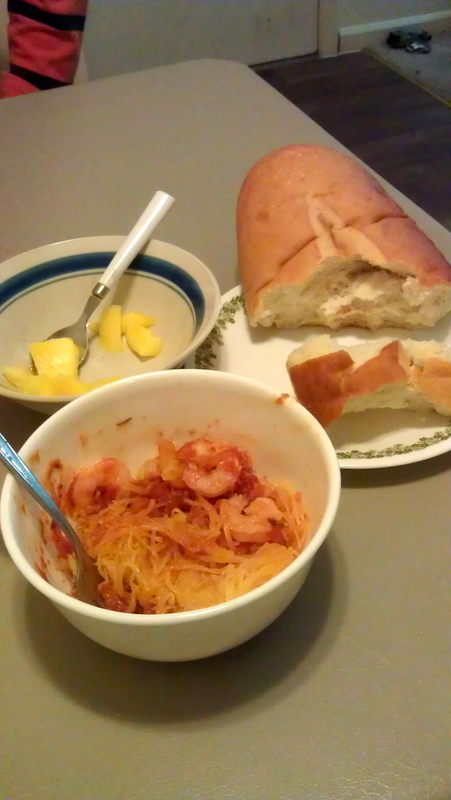 Here’s the spaghetti squash (with sauce and shrimp), some mango, and the “Aladdin” bread. Yum! Please note that Ryan ate a peanut butter and banana sandwich on half of the Aladdin loaf after finishing his meal. I guess that’s what happens when you’re 6’3″ and super active. This entry was posted in Uncategorized and tagged audiology, dates, food by the mile report. Bookmark the permalink.